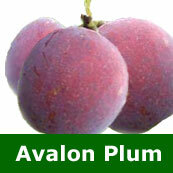 Avalon plum trees tend to fruit large round oval and quite red fruits and offer a quality dessert plum. It tends to be a bit stingy in the early years with fruit so if you are looking for a quick crop, buy the smaller Pixy root stock. Fruit will keep for about 1 week and Avalon Plum trees are considered to be good croppers with a good level of disease resistance.